Alvaro Martin ‘84, pictured second from the right, will have the call of the first Spanish language Super Bowl on ESPN Deportes this Sunday. UPDATED: February 5, 2016 at 3:20 a.m.
­When thinking of the Super Bowl, images of Doritos commercials and chicken wings intermittently sprinkled with football may come to mind. The words Latino and Harvard, however, are not immediately thought to be synonymous with football, let alone the crown jewel of the NFL season. 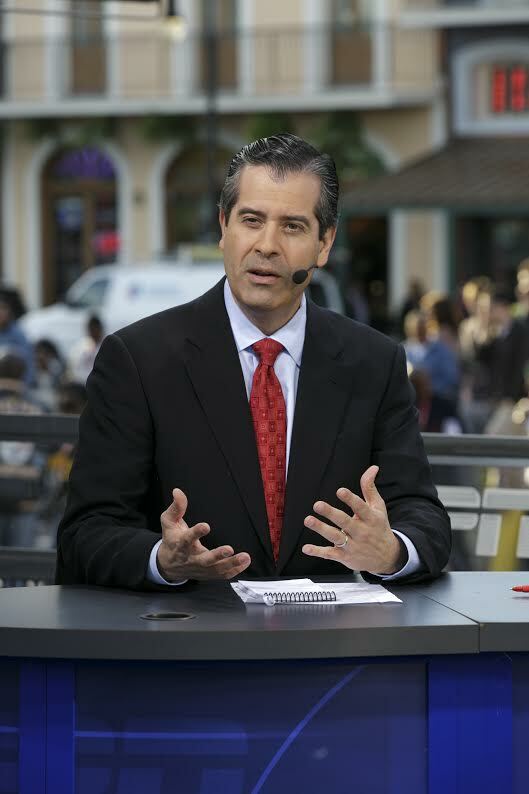 But in its 50th rendition, the Super Bowl will have a healthy dose of both thanks to ESPN Deportes color commentator Alvaro Martin ’84. Martin, a Winthrop House graduate who was born in Puerto Rico, will be the play-by-play announcer for ESPN Deportes this Sunday when the Super Bowl is simulcast by ESPN Deportes in Spanish for the first time ever in the United States. First announced by ESPN on Dec. 28 last year after CBS gave the rights to cover the game, the coverage will facilitate the network’s desire to cater towards the ever growing Hispanic market. Outside of the States, countries like Mexico and Brazil have seen a growth in their respective fanbases, and the two nations account for the second and third-most NFL followers, respectively, behind the United States. As ESPN Deportes makes its Super Bowl debut this Sunday, Martin will be part of a crew commandeering the coverage alongside a pair of fellow ESPN Deportes stalwarts. Along Martin will be analyst Raul Allegre—a former NFL kicker born in Torreon, Mexico—and sideline reporter John Sutcliffe, renowned among Hispanic audiences as the main correspondent for El Tri, the Mexican National Soccer Team. While Martin will be broadcasting to millions of viewers in the northern and southern hemispheres on Feb. 7, this reality is one that would have seemed improbable when the Puerto Rican was attending Harvard. The path Alvaro took to land a spot on the ESPN podium is an unconventional one to say the least. While an undergraduate at the College, Martin concentrated in government, although he originally planned on studying engineering. A sophomore seminar changed his mind, and after applying and being accepted to Harvard Business School, Martin opted to work in consulting for two years before fulfilling his MBA. After graduating from business school, Martin joined the media practice team at McKinsey and Company in New York City, where he remained for two years before becoming an independent consultant. As fate would have it, his first client in his new practice was ESPN International, resulting in a crossing of paths between Martin’s well-established interests in communications and the wide world of sports. His interests in communications date back to the days he spent in Cambridge as a member of WHRB, Harvard’s student radio station. Although his time at the station was spent in the folk music department, the experience behind a microphone proved valuable for his future career as a color commentator. His debut as a sports commentator came on a whim, a stark difference from producing a weekly show that reached the greater Boston area. On a visit to a college football game between Big Ten teams Purdue and Illinois in 1991, Martin was brought into the booth and asked to put the headset on. As Latinos, Martin and Allegre have been involved in the Latin American community and culture in some capacity since their early days. As an undergrad, Martin was part of La O, or La Organización de Puertorriqueños en Harvard, and was part of an all-Hispanic blocking group. As a Hispanic on campus, Martin felt compelled to join the small but intimate community. Martin attributes his interest in communications and media to his time spent as a member of the WHRB radio station at Harvard. Allegre, on the other hand, came to the States as a high school exchange student in the fall of 1977. Despite never seeing a football game before arriving in the U.S., Allegre’s kicking ability led to him to the University of Montana, where he played for two years before transferring to the University of Texas. Soon after graduating, he was picked up by the Dallas Cowboys as an undrafted free agent and traded to the Baltimore Colts, which became the Indianapolis Colts after his first season. Allegre also played for the New York Giants and the New York Jets during his nine-year career, which saw him receive one Pro Bowl nomination and two Super Bowl rings with the Giants. As Latinos with an extensive background in football who could be relatable to Hispanic audiences, the two commentator became a pivotal part of ESPN’s efforts to expand into the Spanish-speaking market. Allegre and Martin were tasked with creating a market that Spanish-speaking viewers would be attracted to and turn to when they were asked to work together on ESPN Deportes’ Sunday Night Football. One of the challenges of creating and navigating a potential Hispanic market was having the ability to act as a guide for those that were tuning in to a sport for the first time. As some of the first people to broadcast and cater to a burgeoning Hispanic audience in Spanish, Allegre and Martin found the task of commentating was not only a matter of calling the game like most commentators but also addressing any potential questions the viewership might have that were being exposed to the sport for the first time. This was especially true in light of a Hispanic audience who, while watching the then solely English broadcasts, had a crude or misled understanding of leagues such as the NBA or NFL. Since Martin and Allegre started catering NFL coverage to Hispanic audiences, the diversity of the NFL’s viewing population has expanded greatly. Sunday games and Monday Night Football are currently being broadcast in 19 countries throughout Central and South America, bringing the game to more viewers than ever before. The concept of bringing an American sport overseas was a daunting one. When ESPN Deportes was first established in 2004, there were questions concerning every aspect of the manner in which games would be brought to international Spanish speaking audiences. Additionally, with people from different countries possessing different dialects, Martin and Allegre had to focus on using language that did not alienate any viewers. The task of taking a foreign audience through the game of American football itself also comes with trials and tribulations. When dealing with an international audience, the knowledge of the viewership can vary on a wide spectrum, from first time viewers to dedicated fans. The solution to that puzzle is finding the right combination in order to please both audiences. As the number of Spanish speaking fans increases, the demand for more programs that appeal to the demographic also inflates. ESPN Deportes now produces shows that mirror the type of analysis seen on NFL Network, allowing Hispanic fans to dive deeper into the world of professional football on days other than Sunday and Monday. “I did some research and found out levels of viewership in Spanish, and it’s quite eye-opening the amount of interest that there is,” Martin said. “We feel that a big part of that is the work that we’ve done at ESPN because we’re the first to have a weekly show in Spanish for many years. With the introduction of new viewership bringing a new cultural context to American sporting events, the competition for the audience is bound to increase. Having a large enough population of foreign speakers in the U.S. to warrant a simulcast of the Super Bowl in a language other than English shows the potential for other markets to open up in the future. With the announcement of the simulcast of the Super Bowl on ESPN Deportes, the prevalence of the Spanish-speaking demographic of football fans has been pushed even more into the spotlight. The opportunity for Martin and Allegre to broadcast an event as big as the Super Bowl to their Hispanic audience is one the commentators hope will increase an already growing viewership. With the possibility of even more Hispanic fans tuning into the coverage of the Super Bowl this Sunday because of its availability on ESPN Deportes, Allegre is optimistic that even the most casual fans could become loyal followers of further Spanish NFL coverage. Experience certainly won’t be an issue for the commentators when they set up in the booth on Sunday. In fact, Super Bowl 50 will be the 18th time Martin calls the capstone game of the NFL season, with previous games watched by international audiences. Though the veteran has had many calls under his belt, he is still thankful for the chance to bring the game to a larger audience. An earlier version of this article stated that the Super Bowl will be simulcasted in Spanish for the first time ever in the United States. 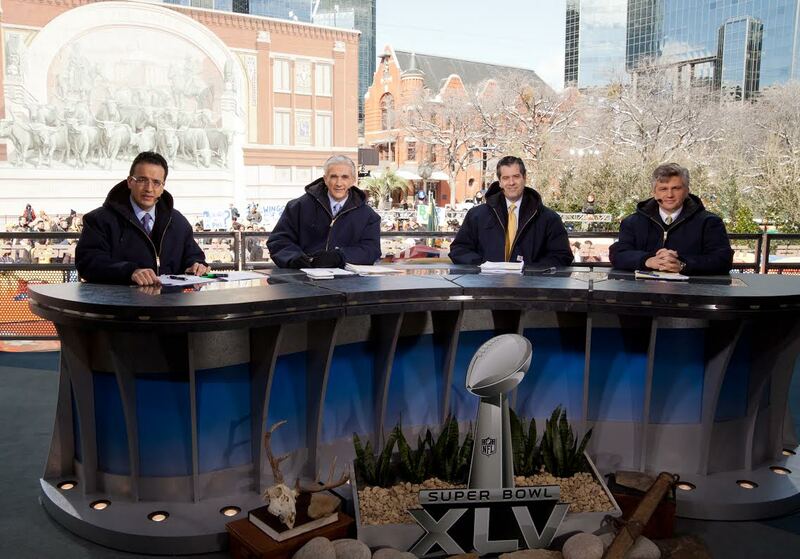 In fact, it is the first time ESPN Deportes, the Spanish-language network, will simulcast the Super Bowl. 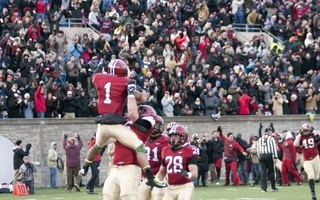 —Staff writer Julio Fierro can be reached at julio.fierro@thecrimson.com. —Staff writer Ariel Smolik-Valles can be reached at ariel.smolik-valles@thecrimson.com. The Instituto Cervantes, a non-profit created by the Spanish government, operates branches in over 20 countries with 54 centers in total. The institute's Harvard branch focuses on research of the Spanish language in the United States.